MVM - They had already shot their news wad prior to the Expo, so a lot of what I have already mentioned in my blog was merely repeated. They have Gunparade March, Aquarion, X, and Moribito: Guardian of the Spirits. They also mentioned that the Cutie Honey live action movie was selling well for them, and also confirmed that the trailer for Dororo on the disc, is indeed an indication that Dororo will be their next live action release. Beez - Beez always comes up with the news that you most desire, and most expect. This time around it was the announcement that Code Geass will be released in the UK. And Manga Entertainment will have the streaming rights to Gurren Laggan in the UK. Manga Entertainment - Currently the biggest anime name in the UK looks set to get bigger with some mouth-watering announcements. Mamoru Oshii's (Ghost In The Shell, Ghost In The Shell: Innocence) most recent film The Sky Crawlers will get a release by Manga late this year or early next. Manga Entertainment have the rights to release Devil May Cry in the UK, and they have also picked up the licence for the Guyver remake, which has just lapsed for ADV. Unlike ADV's seven single discs, Manga will be releasing a five disc complete series set. The biggie… Manga Entertainment have the UK rights to Full Metal Alchemist: Brotherhood, which is just now being released in Japan, and which Funimation are currently streaming to the world in subtitled form. Manga Entertainment will be streaming this show to UK audiences from their own servers as well, and will be releasing the DVDs closely behind the Funimation releases when they are eventually released in the US, probably 2010. UK-centric anime streaming has been conspicuous by its absence so far, and it looks as if Manga will be getting into it in a big way, using Youtube, their own site, as well as i-Tunes and XBox Live. There are also 2 Death Note compilation movies on the way, in similar vein to the Ghost In The Shell compilation movies that were released last year. And as previously mentioned, Shigurui: Death Frenzy is coming in August. Manga are also wading knee deep into the Bluray world, with many of their prior releases such as Blood The Last Vampire, The Girl Who Leapt Through Time, and Origin: Spirits of The Past, joining the Ghost in the Shell movies on Hi-Def. It also seems as if Devil May Cry will see a Bluray release as well. Do you remember the rabid intensity with which fans waited for the Star Wars prequels? That's nothing compared to how certain anime fans have been camped out by their broadband connections, waiting for this second series. Fortunately the chances of suckage are low indeed, adapted as this series is from a set of award winning novels. Yoshitoshi ABe may not be the most prolific of anime creators, but his work always turns heads, with originality, quality and sheer breathtaking imagination that is head and shoulders above his peers. He's only been associated with four anime to date, and each one has been an absolute peach. If you've seen any of Texhnolyze, Niea Under 7, Haibane Renmei, or Serial Experiments Lain, then you will know what I'm talking about. ANN reported last week that he's got back together with his Lain collaborators to work on a new series, Despera. I know it's unseemly for a reviewer to drool, but I can't help myself. It's been a while since I last had one of these news items, and Manga's latest streaming venture may take a while to get off the ground. Fortunately Funimation are still ticking over. It's been floating around the web a while now that Funimation were to start streaming One Piece, but my impression was that it would be one of those region-locked shows, that we in the UK would be deprived of. Not so, as Funimation's Web Portal now has episodes 1 & 2 (subbed and dubbed) of the first series, and episode 391 of the brand new series currently airing in Japan, although this is subbed only. You can guess from the episode numbers that this is one of the most popular shonen anime series of all time, telling the tale of a young rubber-limbed, would-be pirate and his motley crew. The sheer numbers make the possibility of a UK release mind-boggling, even with shows like Naruto and Bleach hitting three figures. This may be a way to stall the constant, "When are we getting One Piece?" demands, or it may just stoke up the fervour, watch it and decide for yourself. Funimation have also recently started streaming the recent Gonzo series Dragonaut, which is notable in that this is one Gonzo series that hasn't been streamed by Crunchyroll. And recently all of Air Master went on the site as well, a show about a gymnast turned street fighter. Last week's expedition into the world of anime began with Disgaea: Volume 1. This one is more for the console gamers, based as it is on a set of Playstation games. It's a bright, colourful and somewhat tongue-in-cheek RPG, and that translates through to the anime, which sees an angel named Flonne, sent to the underworld to assassinate the Demon Overlord, only to wind up helping his son Laharl fight for the throne. And it has bat-winged penguins that say 'Dood' a lot. My review is all ready to be clicked upon. 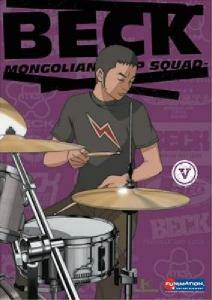 It was import time next, as I got my grubby little mitts on Beck - Mongolian Chop Squad: Volume 5. We're still waiting for the release of the UK disc at this time, but I'm a fully paid up member of the 'Now' generation. The membership has gone up in recent months thanks to the exchange rate, but I'm not complaining, having seen what happens next in this brilliant rock and roll, slice of life series. You too can find out what happens to the Zombie Dog by clicking on my review, but don't worry, as spoilers are otherwise scarce. 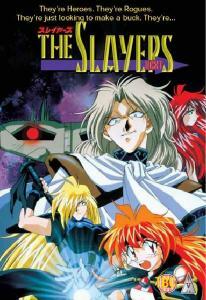 The week came to a close with my regular dose of Slayers. Those monthly releases keep the entertainment flowing, although my reviewer creativity is taking a hit. Still, I managed to eke out a review of this classic RPG comedy series, as the adventures of Lina Inverse and Gourry Gabriev hit new mirthful heights in Slayers Next: Volume 2. Click the link to find out how retro can be a good thing. Funimation released Beck in the US last year, and it's still available from all reputable importers. 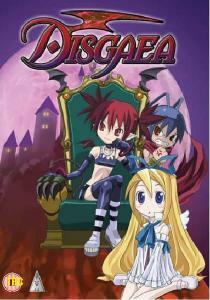 MVM will release both Disgaea: Volume 1 and Slayers Next: Volume 2 on the 8th of June 2009.